[AUGUST 1-2, 1987] Betty Bailey, a gray-haired woman with grown sons, didn't want to go through life without riding at least one magic carpet. Her sparkling blue eyes lit up her unlined face as she described how it felt to embark on her own adventure after completing her first loving task, raising her two sons, ages 21 and 26. Creating her own prize-winning dolls has become her adventure. It wasn't easy learning how to mold the Plasticine into doll shapes and create the features and the clothes to complete them. "The first time I tried to use my kiln, the mold exploded inside it," she said. "I almost quit. But I had already decided I wanted to succeed. So every time I had a setback, I'd just sit back and regroup. I was a quitter before." 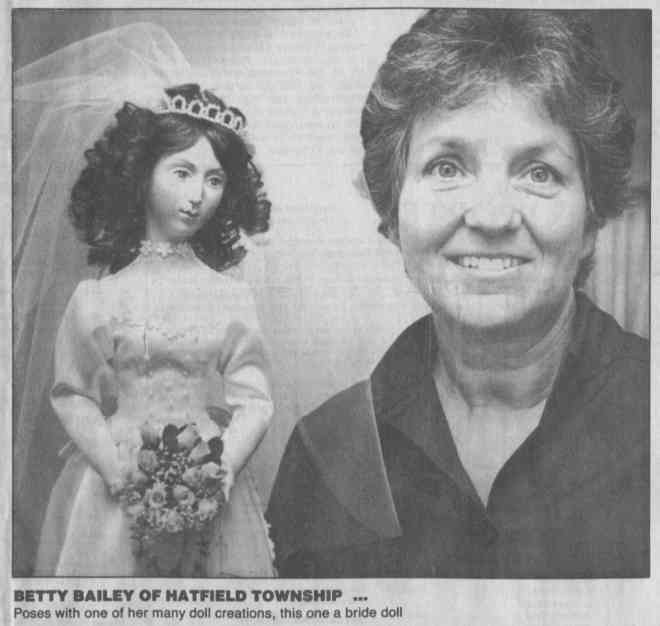 The Hatfield Township resident fell into dollmaking while looking into the value of some of her old dolls. During her research, became interested in doll artists of the 19th century. "It was interesting how they picked themselves up from their own talents," she said. "Some of them were widows, raising children themselves. It kind of consumed me." In a shy voice that sings with lingering accent of her native Louisiana, her enthusiasm was more like that of a 25-year-old than a woman of 52. She has pursued art throughout her life. She has sold paintings and sculpted, but she never before pursued a business. She enjoys combining sculpting, design and sewing, all of which are required for her dolls. "I love working out problems, with the shoes, putting the bodies together," she said. "Everything that I do has a problem. I like them to end up looking natural." If she does period dolls, she researches the era to ensure that the dolls are authentic. One prizewinner is an 1853 fashion doll, another an 1895 fashion doll with a Gibson Girl hairstyle taken from the early 1900s. Other dolls re-create styles in 1900, 1917 and the '40s. She scavenges flea markets for materials such as wigs and jewelry. She works in her basement. Her sewing machines, kiln, work tables bedecked with casts and molds stand side-by-side with a ping-pong table and washer and dryer. She hopes to design a doll for a big company, a doll that will look like a real person, not some idealized version. She looks for models in children who have distinguishing features. "I can't explain the kind of face," she said. "I just know it when I see it." She may not always confine herself to using children as her models, but for now they're her favorites. "Children are sincere, honest," she said. "Whatever they are, that's them."